This recipe for baked Italian sausage and peppers is oven baked in one dish for a really easy week night meal. 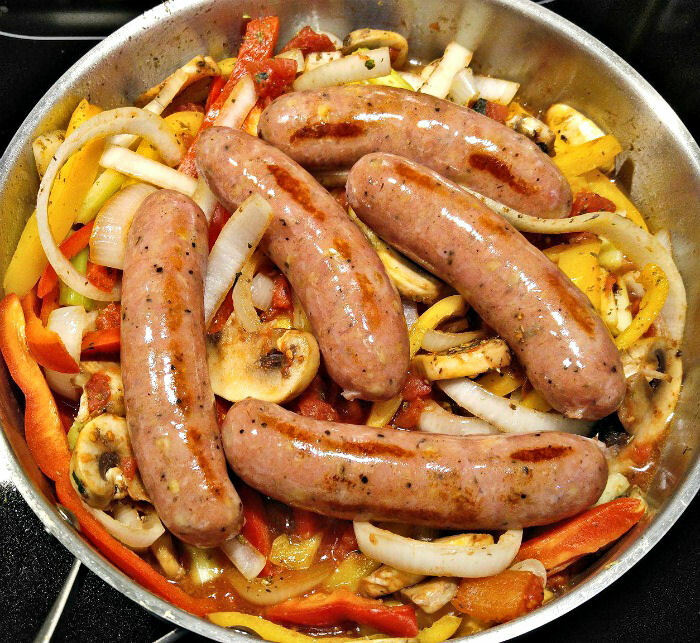 Flavorful whole sausages are combined with tomatoes, Italian seasonings, sweet peppers and onions for a tasty dish that is really simple to prepare. It is one of my favorite 30 minute meals. 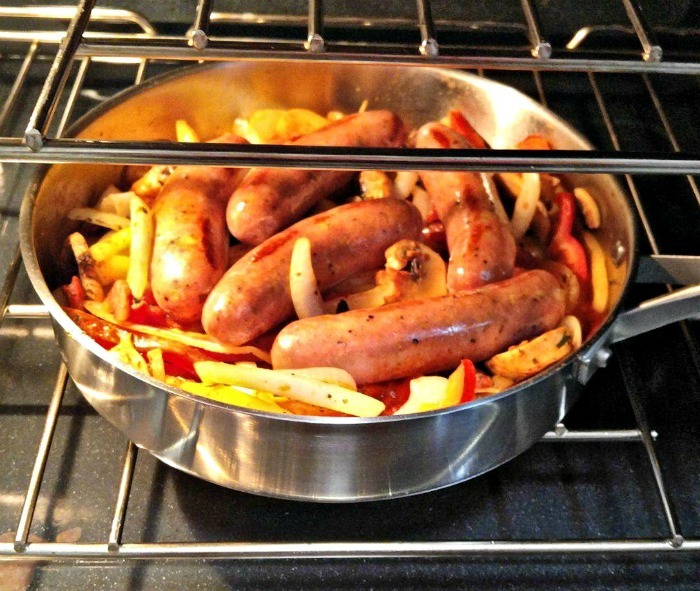 One of our favorite meals, especially when it is cold, is a big dish of Italian sausages and peppers. Normally, I cook everything on top of the stove in a frying pan, but for this recipe, I decided to finish this one pot meal in the oven to give it more of a roasted flavor. I love that this dish comes together in about 30 minutes. It’s cooked in one pan which makes the clean up easier later. Making these oven baked Italian sausage and peppers. 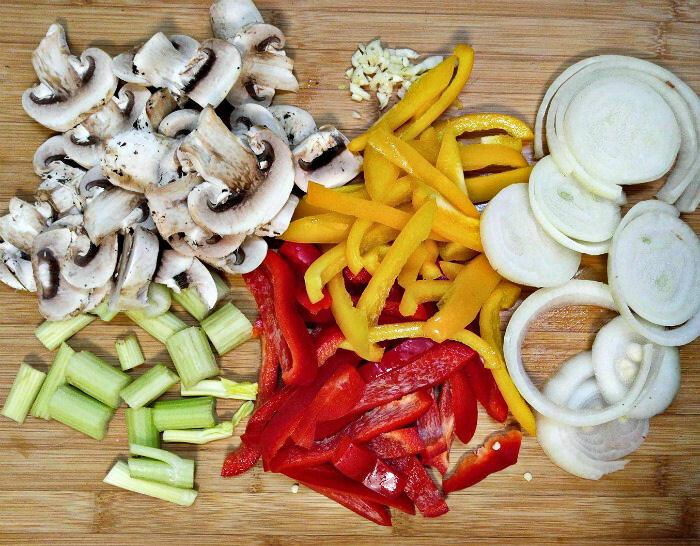 I used yellow and red peppers to make this but I have done it with green, as well.Any peppers will do, though and you can add in other veggies as well. 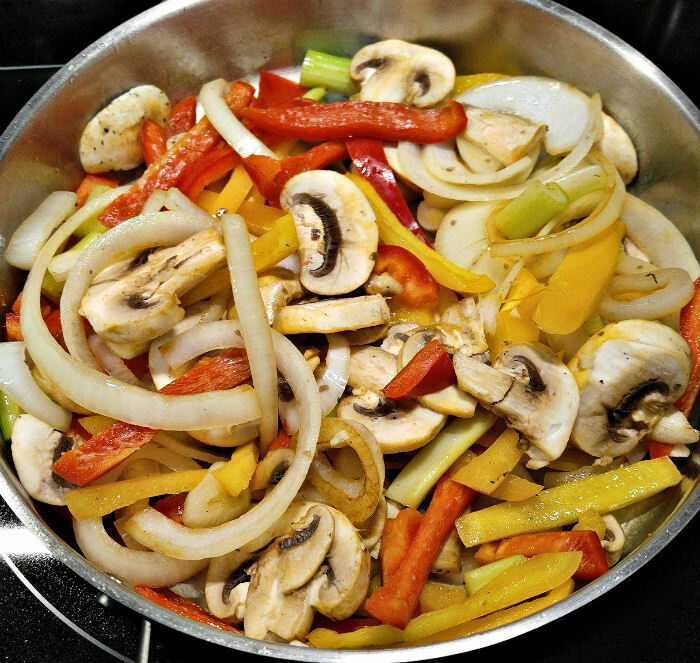 Today, it was onions, garlic, mushrooms and sliced celery with the peppers. Start by browning the sausages in an oven proof saute pan on the stove over a medium high heat. You just want to get a bit of color to them and partially cook them to save on the oven time, but not cook them all the way through. Remove and set them aside. Put the onions, celery and pepper in the same pan and cook for a minute or two, to give them a nice char. Once again. Don’t cook them until they are soft. Just stir them around until they get a bit of browning going on. I didn’t use any oil in the recipe, but did have a bottle of coconut oil spray that I used during each addition, just to keep the vegetables from sticking. Stir in the mushrooms and garlic, cook for another minute. Look at that color and all those fresh flavors! Stir in the diced tomatoes, basil, Italian seasonings, and salt and pepper. Give everything a really good stir and then lay the sausages over the top of the vegetables. Place the whole pan in a preheated 375 º oven for about 20-25 minutes until the sausages are cooked through and the vegetables are nicely roasted. Easy peasy! And the sausages cook and flavor the vegetables below so that the whole dish has one great taste that only comes from one pot cooking. Each layer of flavor adds a bit more taste to the dish until it all comes together in such a wonderful way. The taste of this dish is both savory from the tomato sauce and seasonings, and spicy from the flavor of the Italian sausages, but without too much heat. It’s warm and comforting and perfect for a busy winter night. We have this dish often. Sometimes I serve it on its own and other times I switch it up to use green peppers and add some cooked pasta. Whichever way we have it, it’s always a favorite! 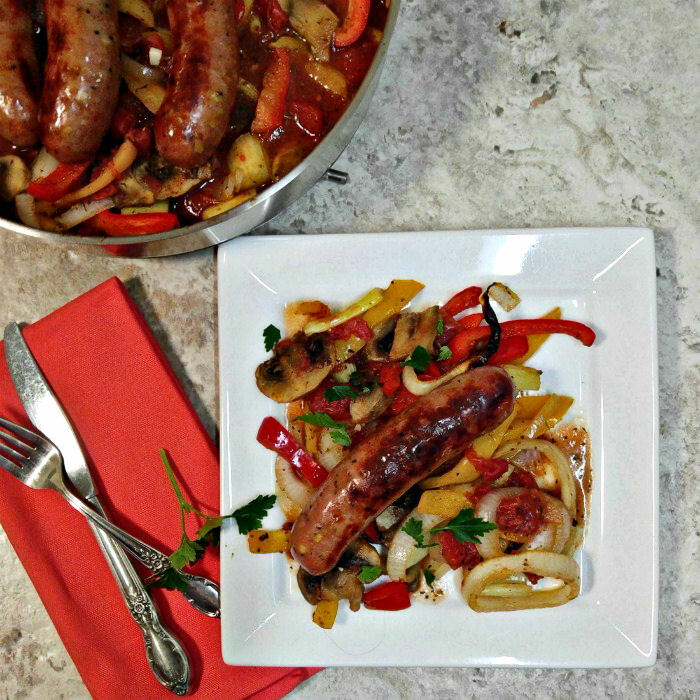 If you are looking for an easy one pot meal that will be ready in just about 30 minutes, and is gluten free, try this Italian sausage and peppers recipe. It will become one of your favorites too! 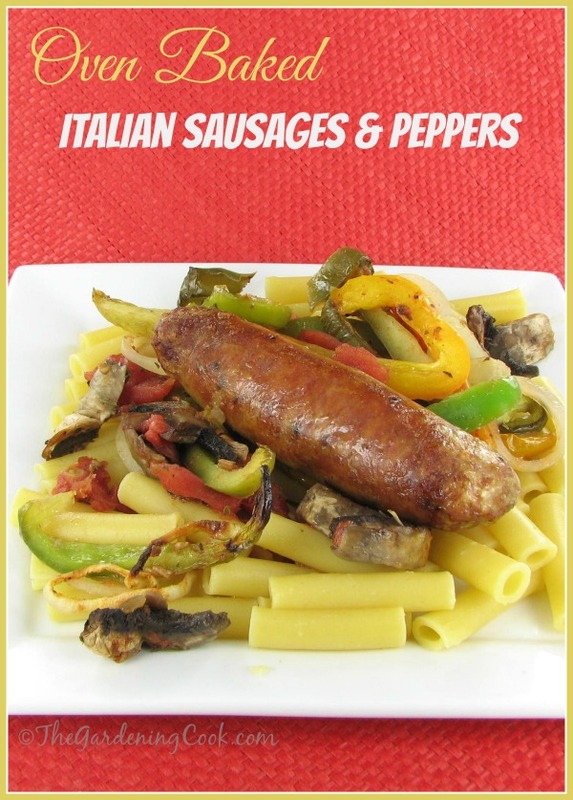 Admin Note: This post for baked Italian sausage and peppers first appeared on my blog in January of 2014. 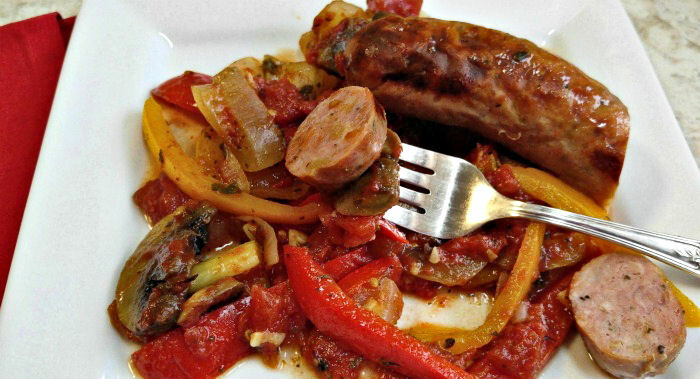 I have updated the post to add more photos to make cooking this Italian Sausage and Peppers Recipe easier. 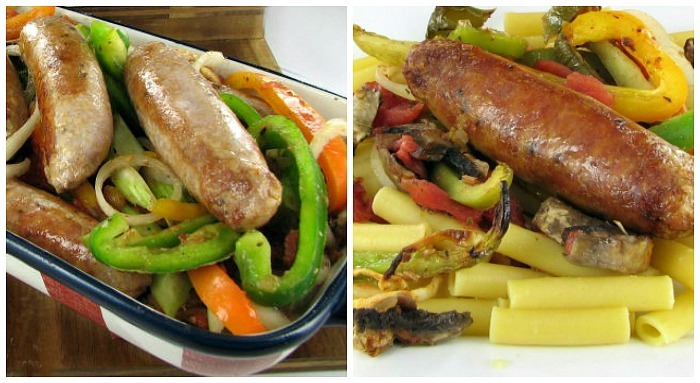 These tasty baked Italian sausages and peppers are made in one pot for easy clean up. The recipe is gluten free and tastes amazing. Preheat the oven to 375º F. Spray a deep sided oven proof saute pan with coconut oil over medium high heat. 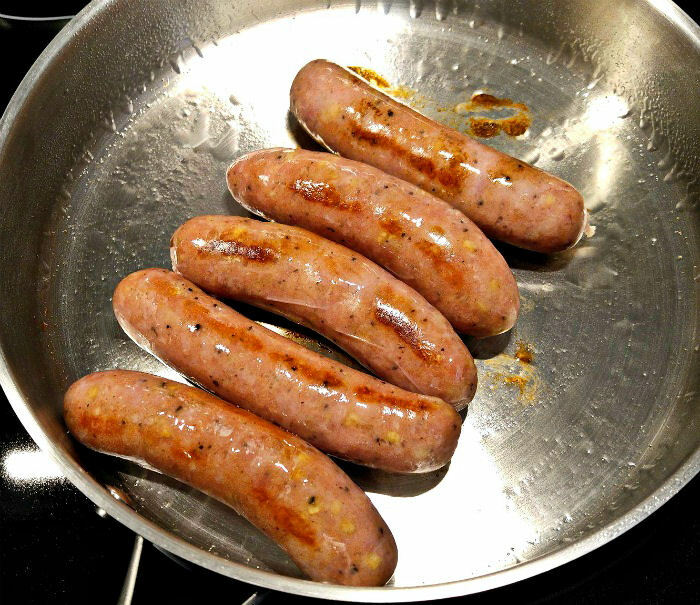 Brown the sausages in a non stick frying pan but do not cook through. They will finish cooking in the oven. Set them aside. 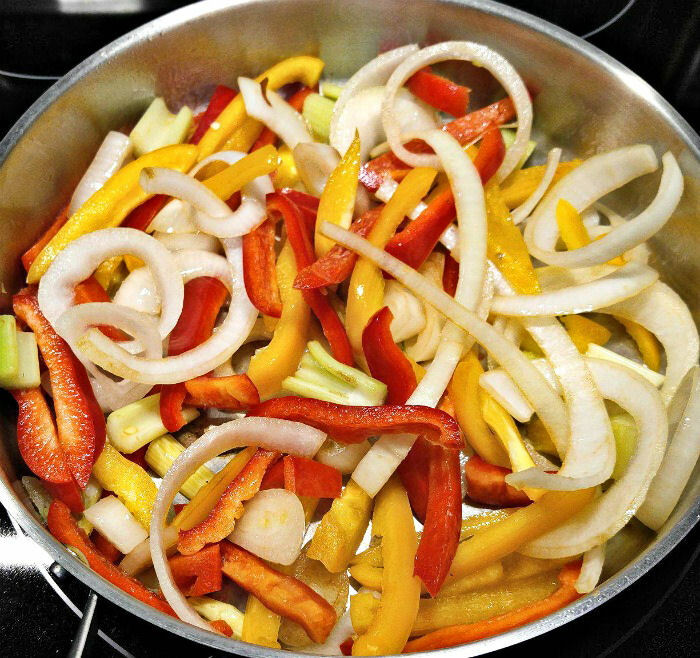 Place in the onions, peppers and celery in the same pan and cook for just a minute or so. You don't want to make them soft. Just get a bit of a char on them. Add the mushrooms and garlic and cook another minute. Stir in the canned tomatoes, Italian seasoning, basil and salt and pepper. Mix well to combine so the veggies are well coated. Place the browned sausages on top and place the whole pan in the preheated oven for 20-25 minutes. Serve with pasta or cooked noodles and sour cream. Enjoy!